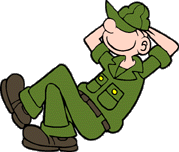 Interesting how Beetle Bailey wasn’t in the Army when Mort Walker originally started the comic strip. A newspaper editor’s suggestion to have Beetle visit a recruiting office and get drafted proved to be the best advice Mort Walker ever received. Lots more strip explanation videos over on the Beetle Bailey YouTube channel. If you’re a fan make sure to check out the official Beetle Bailey website. The drawing style and “safe” humor are both very typical of the 1950s era time period comic was extremely popular in.